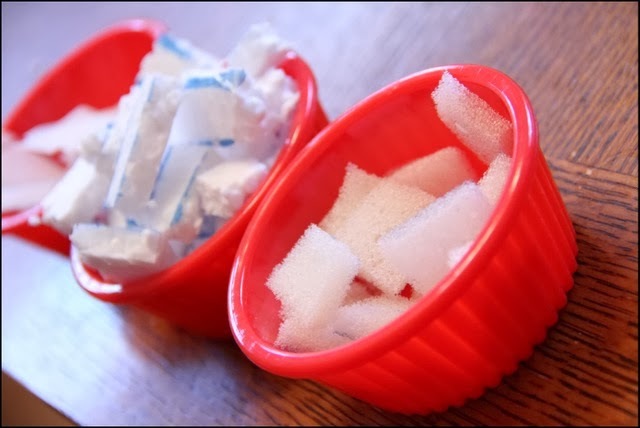 This post is a special guest post written by Leanne from Sugar Aunts. This project focuses on fine motor skills for children ages 2-7 yrs. 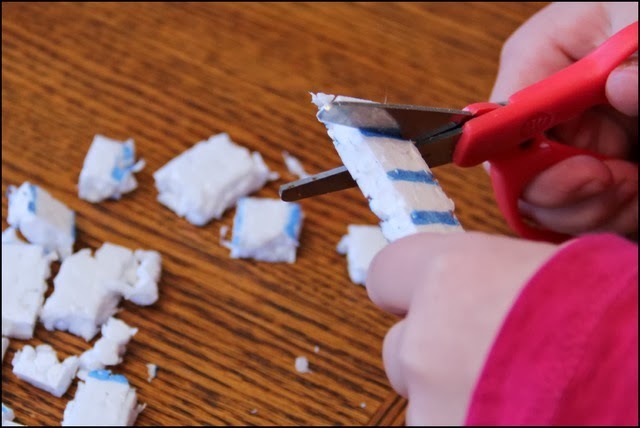 It is the perfect winter craft activity for preschoolers. We love creative crafts that focus on Fine Motor Play. A craft that pulls in developmental skills is much more than a fun activity. While the kids are cutting, gluing, and creating, they are also working on so many skills essential to self-care, handwriting, and scissor skills! 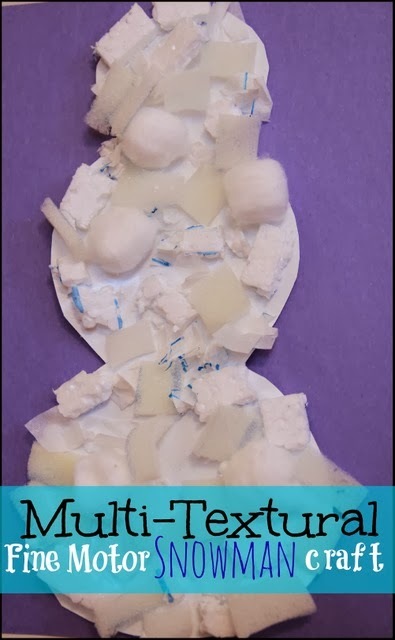 This Multi-Textural Fine Motor Snowman craft was a ton of fun to create and worked on many fine motor skills. The multiple textures added a sensorial bonus...and a great texture to our snowman! 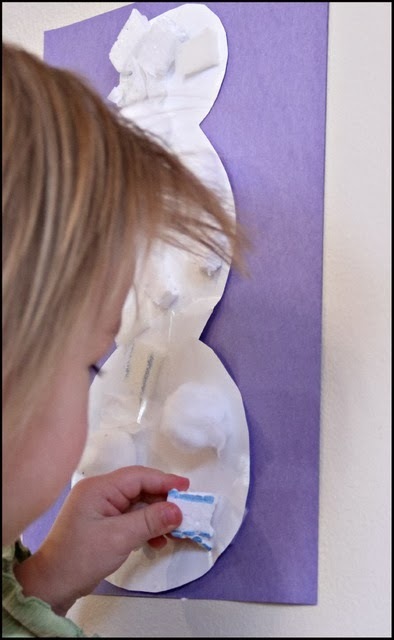 This Fine Motor Snowman craft was a big hit with my daughters. We started with a snowman cut from white contact paper. This was glued to a sheet of blue construction paper and then taped to the wall. I wanted the task to be done on a vertical surface to further challenge the fine motor dexterity. Working on an inclined surface such as an easel or wall encourages a tripod grasp when manipulating small pieces. An extended wrist (wrist bent back in the direction of the back of the hand) and a tripod grasp is necessary for an appropriate grasp on writing utensils. Big Sister (age 6) is in kindergarten and developing her scissor skills. I pulled out a variety of textured materials. We had strips of thin Styrofoam, foam packaging sheets, and tissue paper. 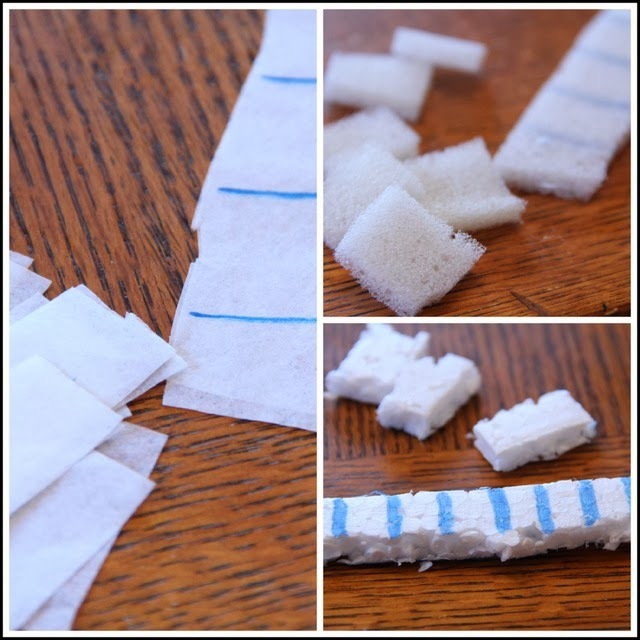 Strips of the materials had marked lines for her to snip. Cutting small snips along a line is a great way to work on scissor skills and line awareness with a new scissor user. 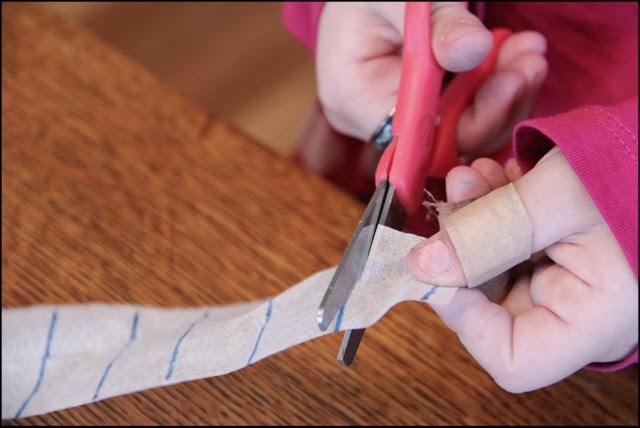 Tissue paper is a very thin and flimsy material and requires great scissor control. This was a fun material to try and the short cuts were just right for Big Sister! Once all of our materials were snipped into little squares, we sorted them by texture. This was a fun way to explore the differences. Next, we stuck the different materials onto the contact paper snowman. This part of the craft was fun for Baby Girl (age 2). She loved sticking the different materials onto the contact paper and worked for a LONG time to fill up the whole snowman. 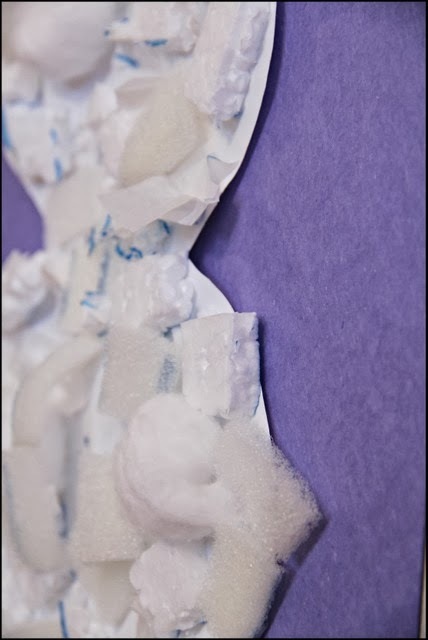 Our multi-textural snowman was a fun way to practice scissor skills and work on some fine motor areas while creating a winter craft for kids! The Sugar Aunts are three sisters who blog about all things creative in motherhood. They love playful learning, creative kid's crafts, sensory and fine motor activities, kid's party themes, DIY, and so much more. Between the three Aunts, there are 6 cousins (with more on the way!) who are around each other so often, they are more like siblings than cousins! You can see the action at www.sugaraunts.com.